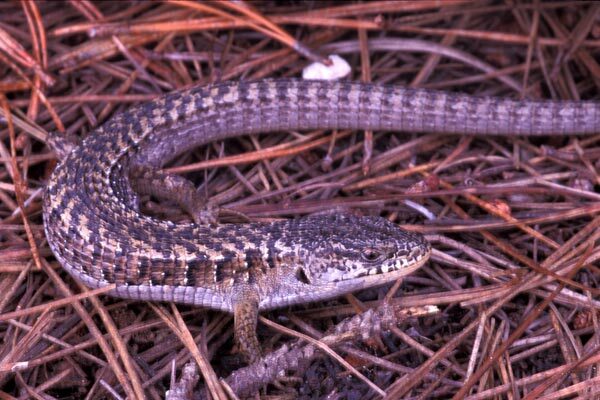 Alligator lizards are probably the second most common lizard where I live on the central coast of California, after western fence lizards, so they don't seem too exciting to me. But I suppose if you lived where alligator lizards didn't you'd think differently! 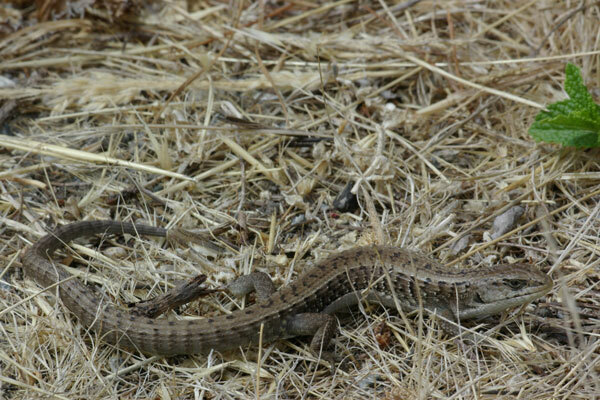 Most of the alligator lizards I see are in the thick of twiggy bushes, presenting a photographic challenge. This cooperative fellow was under a log but chose to pose for me when uncovered. I found this lizard under a log on a coolish day. It was willing to pose for me atop the log it had been under. 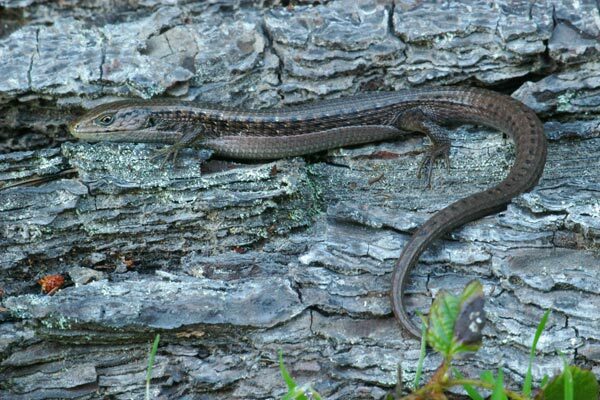 Angie Harer found both of this day's two alligator lizards. The other one was larger, but it bustled off noisily into the bushes. This young adult was more willing to sit still for a few photos. We visited Indian Pools Trail on a drizzly afternoon primarily so that our larger dog Champ could do some splashing to get his mind off of the long bumpy car ride over Kaiser Pass that we had just concluded. 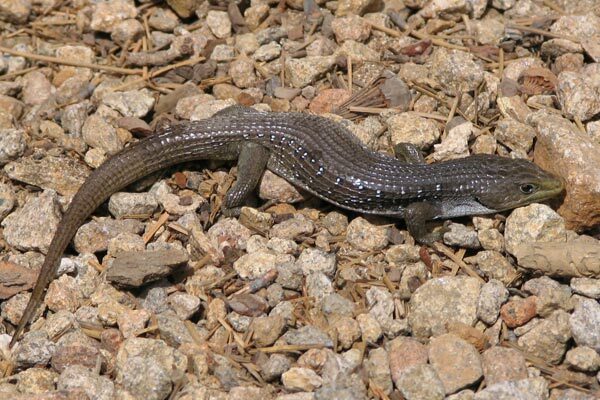 In the parking lot I saw something vaguely lizard-shaped scuttle under a bush, and following it a bit revealed that it was an alligator lizard with a very stumpy tail (broken off and just starting to regenerate). However, its scuttling was too much for me, and I couldn't get a photo. 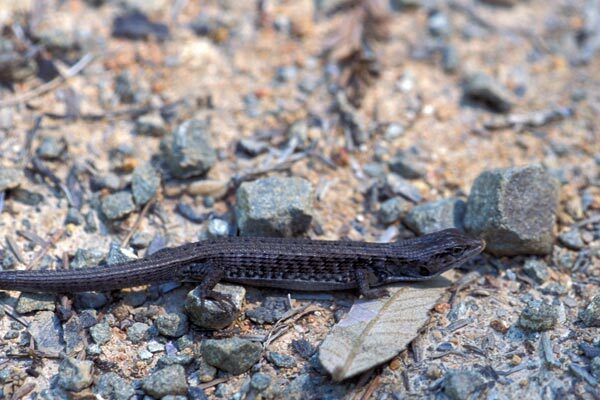 Later, while hiking along the creek, I turned over a hunk of bark and uncovered an alligator-lizard-shaped shed skin. This inspired me to turn over many, many hunks of bark near a large fallen tree. I found five more alligator-lizard-shaped shed skins before catching a brief glimpse of another stumpy-tailed individual escaping from me. That one did not put in another appearance, but a couple of dozen hunks of bark later I saw this third one, with a slightly longer (but still regrown and short) tail. This one did not evade my camera. On a cool, overcast morning, most lizards would not have bothered coming to the surface. 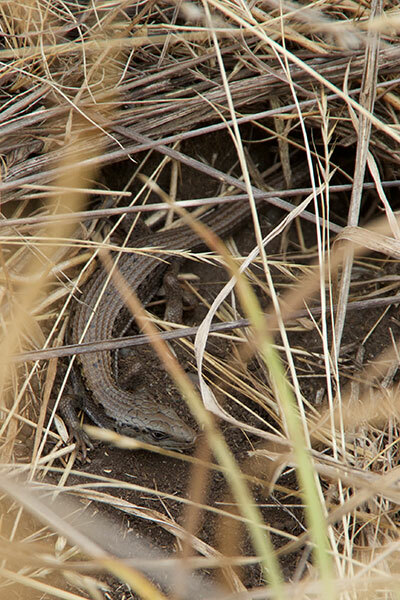 But it must have been just warm enough for this tough little lizard to try a little mostly-concealed basking. I spotted it as we walked past, and managed to take exactly two photos before it decided that avoiding the big hulking monster with a camera was more important than gaining a degree or two of body temperature, and down a burrow it vanished. 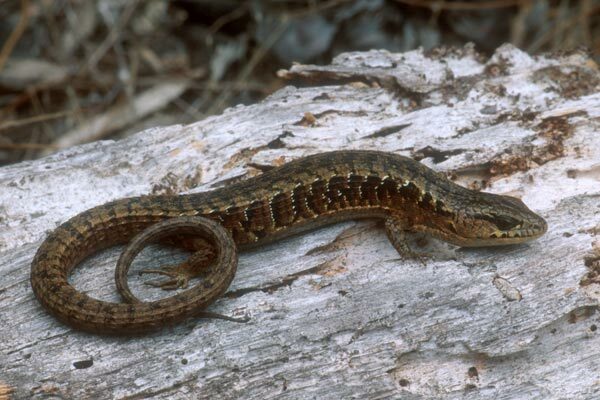 This medium-sized alligator lizard is colored and patterned like an adult, but is only about half of its eventual size. 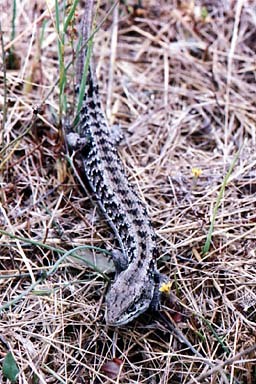 I had a look at its belly to determine that it was a Northern Alligator Lizard and not a Southern one. At this wet time of year most of the herps lurking under logs were salamanders, but this alligator lizard added a little diversity.